For many years Treetops tried to source a lightweight open-weave silk fabric for our clients, but nothing ever seemed just right. So in 2016 we decided to design our own unique fabric which in now being woven exclusively for us. Treetops has created these videos to share some tips and techniques about working with our Silk Mesh. NEWS FLASH! We have just discovered you can indeed ‘Snip and Rip’ our Silk Mesh fabric. Thanks to a wonderful textile friend in South Australia, Maude Bath. We have just discovered you can indeed ‘snip and rip’ our fine open weave (dyed) Silk Mesh fabric. Follow these simple instructions or better yet watch our short video below. The undyed (natural) Silk Mesh contains too much sizing to easily rip in this manner. You will need to ‘pull a thread’ and cut up the channel. If you need help, we have a video for that as well, see below. In case you would like a printed version of the video, please click on these PDF links. Discovering Silk Mesh and Pulling a Thread in Silk Mesh. A huge thank you should go out to Soosie Jobson, my head computer tech and head video engineer. She has many areas of talent, one of which being her own YouTube channel where she teaches free tutorials about 3-D shrinkage rates other felt related things. Check her out at www.soosie.com.au. 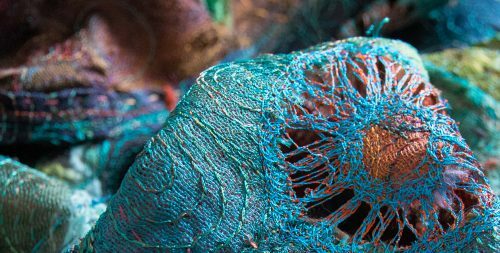 Thank you to Michelle Mischkulnig of Chelle Textiles, Victoria, Australia for being instrumental in developing an amazing selection of techniques for using our Silk Mesh in her free machine embroidery. She has an abundance of projects on the go. To find out more about her inspiring work and teaching schedule go to http://chelletextiles.com.au/ or her Facebook page Michelle Mischkulnig (Chelle Textiles). 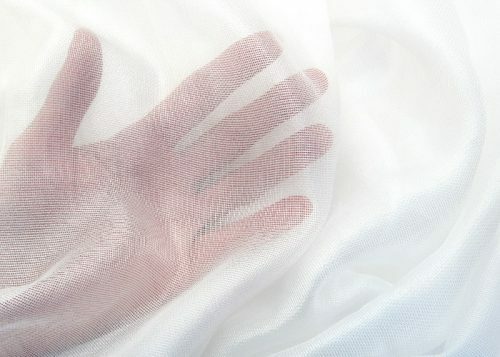 You are welcome to purchase our Silk Mesh undyed. Silk has amazing abilities to dye more easily and brilliantly than wool. 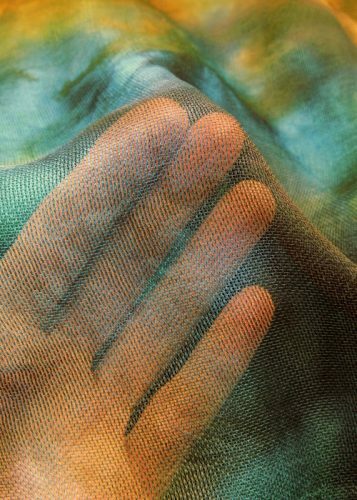 For stunning Eco-printing try Nuno-felting Silk Mesh with Superfine Merino or simply print the Mesh on its own. Make sure you secure any cut edges because they will fray. To view product and prices click here. Have you fully Fulled your Felt? Have you FULLED your felt enough?? Does YOUR nuno look like the sample on the left or the one on the right??? 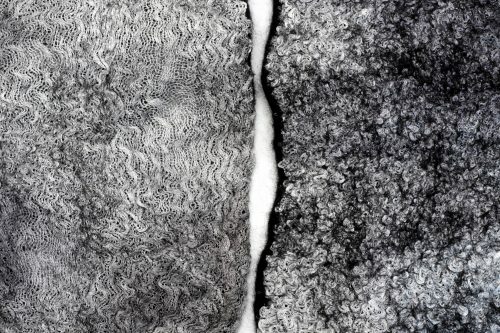 These samples are from the same piece of Nuno felted Silk Mesh (Snowy Owl colourway) and superfine Merino tops (Black Pearl). Sample on the left has NOT been fulled enough – it will eventually pill and loose shape. Sample on the right has been fulled twice to reach the best results. 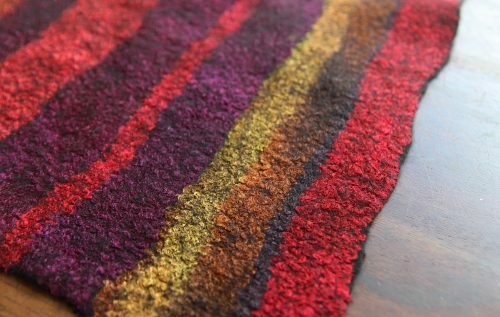 Shrinkage was almost 50% , Read more about Fully Felted Felt at http://treetopscolours.com.au/wool-felti…/fully-felted-felt/. 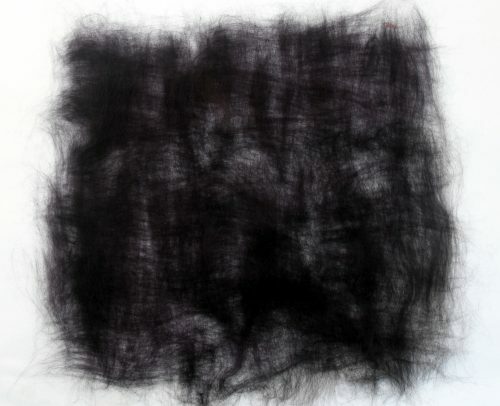 The below photo is 10 -15 grams (.35 -.53 ounce) of wool laid out per 1 metre square (40 inches square) of Silk Mesh fabric to created the a lightweight nuno felted cloth. Below is how the wool lay-out would look. This is an excellent weight for a scarf. 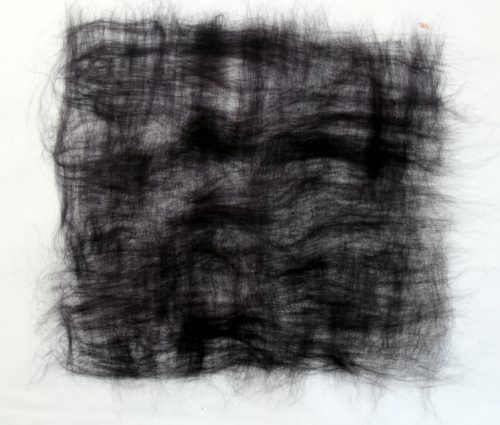 The photo below is 25 – 30 grams (.88 – 1 ounce) of wool lay out per 1 metre square (40 inches square) of Silk Mesh fabric to created medium weight nuno felted cloth. Below is how the wool lay-out would look. This is an excellent weight for clothing. Have any leftover scraps of Silk Mesh? Why not nuno felt them into a stripe pattern? A lovely scarf weight fabric is created by using 10 -15 gms (.35 -.53 ounce) of wool in a metre (40 inches) square. To be quick I just cut these pieces of mesh fabric with scissors, so they are not really true to the straight of the grain, which is what you get when you ‘pull a thread’. I also get better results if I prefelt the background first, then all the fabric stripes. Treetops has developed our own unique lightweight, open-weave silk fabric. After years of searching and failing to find our dream fabric, we decided to weave it ourselves! Lustrous, transparent open weave, lightweight and textural – qualities we were looking for and have had specially woven into our cloth.